Wide spread use of social networks and web based services has made web browsers one among the of the most used software, which also made them the weapon of choice for spammers,phishers and hackers. Even people who insists to keep their system up to date, forget to update some of the browser components( browser add-ons/ plug-ins etc.) as these may not have an auto update feature. 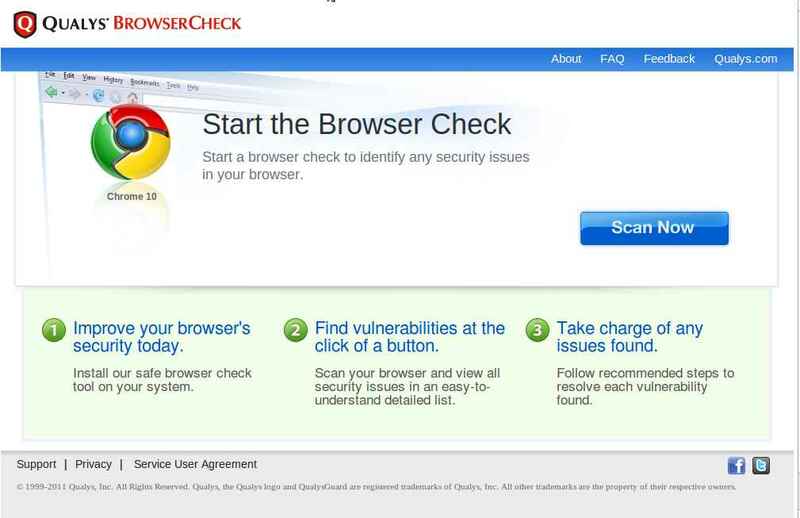 Qualsys has released a free service that will allow you to check you web browser security. It supports all the main stream browsers ( Firefox,Chrome,Opera,IE and Safari) on a variety of platforms like Windows ( XP,Vista etc..), Mac and Linux. Though the service is in beta stage in some platforms and browsers, its still worth to check them out. Detailed list of supported platforms and plugins are available here. Once installed you are good to go to check your browser's patch level.Click the scan now button. Browser check will scan your browser, plugins and addons against known vulnerabilities and give you a report with installed plugin/addon details along with its patch status. Detailed status report descriptions are available in FAQ, but as a rule of thumb "Green" means fully patched and "Red" means vulnerable. Clicking the button will give you more details regarding the problem and possible remedy. Mostly it will be a link to download the latest version. After fixing all the security holes in your browser, I strongly recomment to scan it once again to ensure the security, as some times plugins/addons comes with additional software( for eg google toolbar) that may ruin the security of your browser. 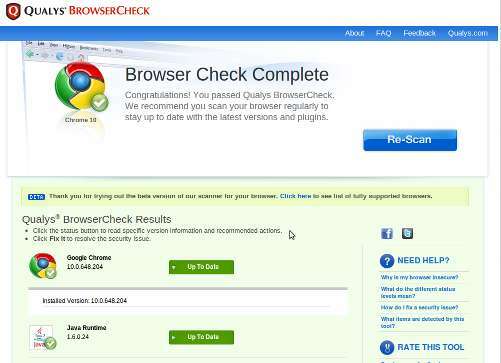 On a final note as with any security solution, browsercheck is not a single self sufficient solution for online security, the ultimate security comes with awareness.